How do you capture a day? In hours? In moments? 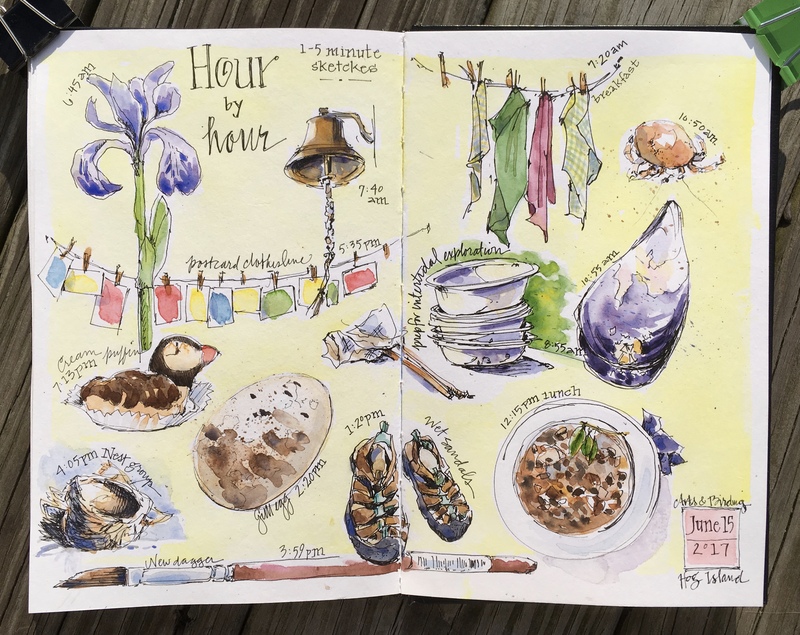 The premise of the Hour by Hour sketch challenge is to put pen to paper every hour of a single day on one journal page, with no sketch taking more than five minutes. I introduced this challenge during a week of teaching at the Hog Island Audubon Camp, where the days are busy and intense. The challenge forces you to work fast and loose, while helping you capture small things that together convey a sense of the day. It’s a good challenge to try when traveling or when you are too busy to take time for a longer sketch. But it’s also a worthwhile exercise if you want to practice being less fussy with your sketching. I did these 1-5 minute sketches with a Micron 02 pen and added watercolor later to finish the page. This entry was posted in Journal, Maine and tagged #worldwatercolormonth, Hog Island Audubon Camp, sketch challenge, travel sketching by Jean Mackay / Drawn In. Bookmark the permalink. Thanks. There were a number of people at the workshop who wanted to try working with less fuss, so this is a great exercise for that. Oh my. This would have to be a day devoted to art for me. I do “Day Maps” using my iPad art journal because I am SO SLOW when working on my watercolor sketches. But those are done in one hour or so in the morning or evening. It’s an ongoing challenge for me to loosen up and I would have to allow more than five minutes and do pencil sketches I could refine later (see why I can’t loosen up – lol). It’s ok – I have been a slow drawing perfectionist for a lifetime and love it. I would just like to hurry up and get more art done. I LOVE how this spread looks! I love this and all the other pages you’ve posted. Like Jessica, I tend to be more slow, but this hour to hour idea will get me to be less picky. I’m always impressed with the flatness of the paper used(I’ve had lots of buckling using Watercolor in journals). What journal do you use with this high quality paper? I use Stillman and Birn sketchbooks with Beta paper. They are terrific for watercolor and come in many sizes. Good luck with your journaling! You are the master of composite pages! Your layouts always turn out so beautifully. I love doing hourly sketches. I once did a sketch every hour on a trip from our home in western PA to Cape Cod. Since I have so much trouble sitting still on a trip, it was a great way for me to pass the time, and I ended up with four pages filled with memories before our vacation even started! I’ll share your post on Facebook – love it! I like approaching pages this way– not really knowing how they will turn out at the start. It’s remarkable that you could sketch in the car– I really can’t, but I think about it. Doing this page was a good way to model for my workshop participants how to jump in without fuss. Glad you like it! Leslie aren’t you in France doing a workshop? would love to be able to paint every hour there! What a GREAT idea and such a beautiful sketch page! Is your time to do the w.c. included in the 5-minute sketch times or do you do the w.c., all at one time, later??? I know I am free to do whatever i want, but I’m interested in how you do it. I had forgotten about the yellow background idea that I saw in one of your previous sketches. Do you use a watercolor wash after all your sketches are done? What tube color is that yellow, it is lovely? Thanks Liz. I did not include painting in my 1-5 minutes. I just came back later and added color, including the yellow background. In this case, I used aureolin yellow. Some of my other sketches are yellow ochre or quin gold. I mainly add a background like this if I think the page is too stark– the yellow will warm up the page nicely. Happy painting! That captures a busy Hog Island day perfectly! Hi Karene– It is fun to see how these small moments add up to tell a story of the day. Oh wait, I acted too fast in writing my first comment. I reviewed your post and see that you answered my questions in your post…except, what it the name of that lovely yellow? Hi Melissa- Thank you! I’m sure whatever you do will turn out well and will be a good learning experience. Oh, thanks for all those memories Jean! Those cream puffins I remember fondly! And the napkin clothesline! If I had any artistic talent whatsoever, I would do that in my regular journal. As I don’t, I stick to words. This is beautiful. I love the idea of it. Hi Lisa- It might be interesting to try this challenge with writing…I wonder what you’d have at the end of a day if you wrote a sentence or two each hour. Interesting. I never thought about that. That is a brilliant idea. Nice. I did some similar activities with a class of mine before we started an extended drawing task. They found it challenging but enjoyed it and it gave them confidence going into the main task. I’m going to blog about it too, soon – hopefully! Sounds good. I think it’s a good way to help people get drawing without much fuss. What a great challenge…I must reiterate that I hope you’ll come back to the PNW, and hope I hear about it if you do. Many years ago, in art school, I wrote down all the sounds I heard one day, from awakening to sleep. It was grueling but wonderful, and made an interesting small book. I love the way your two page spread records the day. I like the sound record. I’ve also made sound maps, where you sit in one place and draw the various sounds around you. I’ll let you know if I make it to the PNW…for now, I’m staying close to home for awhile; settling into life in NY once again. I understand…your version of life in NY is a good one. :- ) Drawing sounds would present a similar challenge to “wording” them. I had to decide quickly on a format that would work – it was a good exercise. Thanks for your presence here!